This card is entered into the Crazy Crafters Team Highlights. Click here to see the full line up of projects and vote for your favourites. 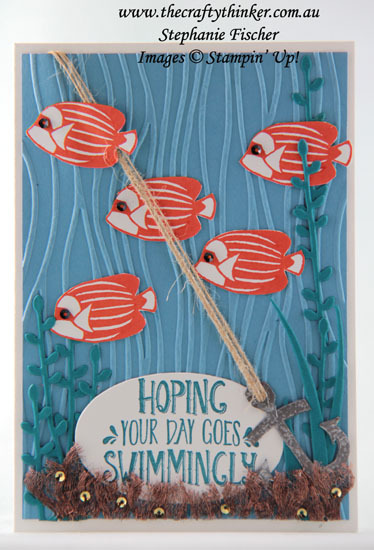 This card is for a fellow who loves to spend time in his boat, hanging a fishing line into the water! I did toy with the idea of adding a fishing line and hook but decided it would complicate the design too much! For the purposes of this card, he's fishing from the other side of the boat! A card for a man who likes to go out in his boat and fish! The base card is made from Thick Whisper White and the layer of Marina Mist is embossed with the Seaside embossing folder. The anchor is silver heat embossed and the Tangerine Tango fish have black sequin eyes. The sea vegetation is cut from Island Indigo cardstock using a die from the Petals & More Thinlits set and offcuts from one of the Swirly Scribbles dies. I trimmed a little bit of the Burlap Ribbon to attach to the anchor and fluffed out small pieces of the Copper Trim to glue to the bottom of the card, brightened with a scattering of small gold sequins.